...The problem, and I suppose this was inevitable, is that Occupy Wall Street is being portrayed as some kind of anti-Tea Party. Left vs. right, blue vs. red, rock vs. country, et cetera—it's the only way we know how to draw battle lines anymore. But how are the two movements meaningfully different? I sure as hell can't figure it out. There are plenty of minor differences, mostly concerning priorities and demographics, but the similarities are much more substantial. Both are popular uprisings against powerful-but-nebulous entities believed to be responsible for America's economic struggles. Both are defined not by easily-identified leaders, but by the sum total of countless unique viewpoints, and thus are not capable of articulating their goals with any cohesiveness or specificity (nor should they be expected to). And both movements, to borrow the classification scheme created by Bill O'Reilly, are teeming with both pinheads and patriots. And yet, over the last week or so each side has generated mountains of commentary saying, essentially, this: You know the one-sidedly [negative/positive] portrayal of the Tea Party we've been pushing for two and a half years now? Well Occupy Wall Street is totally the opposite! Paul Krugman describes OWS as "a popular movement that, unlike the Tea Party, is angry at the right people." Meanwhile, Ann Coulter says the OWS protesters are angry at the wrong people (and also have poor hygiene, because why not?). Keith Olbermann says OWS is legitimately a grassroots movement that, at least at first, was ignored by the media. 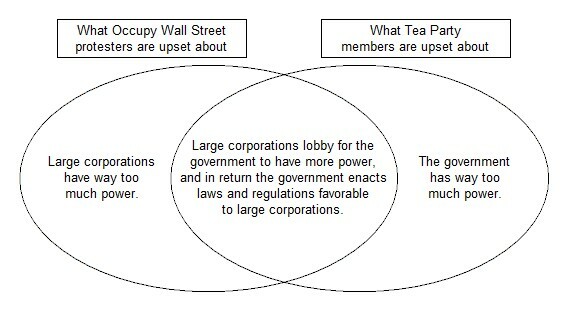 Rush Limbaugh says the Tea Party is the "organic" one, while OWS was "manufactured" by the media. ThinkProgess claims the OWS protests "better embody the values of the original Boston Tea Party." BigGovernment insists the protesters are "more aligned with Marxism; with Democratic Socialism; with Soviet Era Collectivism; with the very dangerous and elitist Progressive Movement" than with anything even remotely "American". ...Occupy Wall Street, at its core, is a reaction to the increasing power and influence of large corporations. The Tea Party, at its core, is a reaction to the government's constant interference with private enterprise. But wait a minute—aren't those things connected? Bailouts, subsidies, tax breaks, special rights and privileges, regulations designed to restrict competition—to name a few of the many ways the government protects and stimulates corporate interests, and those things are every bit as anti-free market as, not to mention directly related to, the high taxes and excessive bureaucracy that gets Tea Partiers riled up. In other words, aren't these two groups—Occupy Wall Street and the Tea Party—raging against different halves of the same machine? Do I have to draw a Venn diagram here?